Sailboat Ornament Address Plaque - - two-sided address sign comes with a sailboat ornament. Personalized with your one line or two line address. Made in America. Three sign styles: lawn mount, mailbox topper, or post mount. Lawn mount plaque comes with two 24" lawn stakes. Mailbox topper attaches to your curbside mailbox with the included hardware. Post mount sign is ready to attach to your own post. The sailboat ornament is finished on both sides. 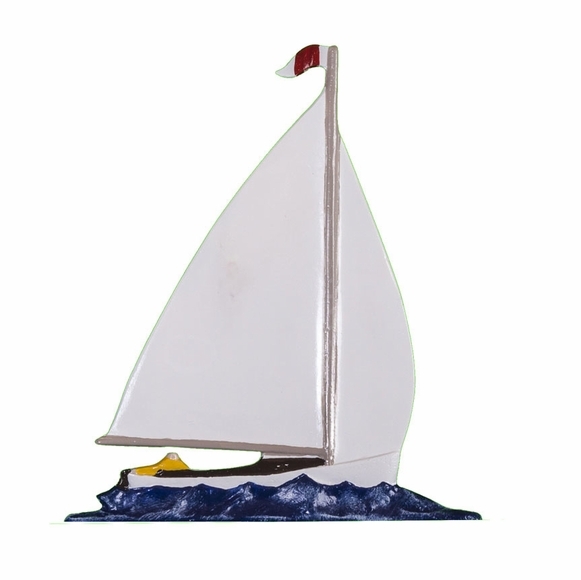 One line sign + sailboat: 14.75"W x 13"H.
Two line sign + sailboat: 14.75"W x 14.5"H.
One line sign section only: 14.75"W x 3.25"H.
Two line sign section only: 14.75"W x 4.75"H.
Sailboat colors: gold bronze, swedish iron, and "natural." Personalized address sign with horse ornament. Lawn mount, mailbox mount, or post mount.